Due to its use in cryptographic protocols such as the Diffie–Hellman key exchange, the discrete logarithm problem attracted a considerable amount of attention in the past 40 years. 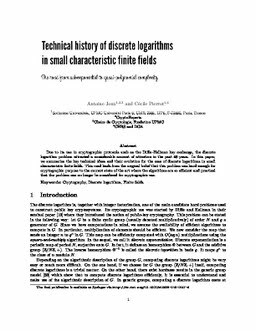 In this paper, we summarize the key technical ideas and their evolution for the case of discrete logarithms in small characteristic finite fields. This road leads from the original belief that this problem was hard enough for cryptographic purpose to the current state of the art where the algorithms are so efficient and practical that the problem can no longer be considered for cryptographic use.